On behalf of the children, staff and governors, I would like to take this opportunity to warmly welcome you to our website. As you explore, I hope that you will see the exciting learning opportunities and enriching experiences that our children absorb here and begin to understand what makes Broadwater the very special place that it is. 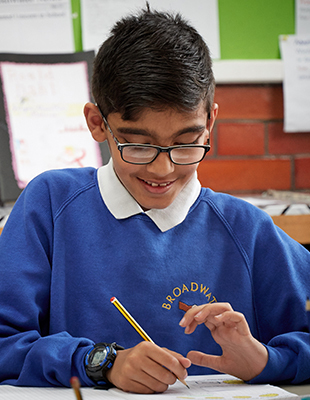 At Broadwater we uphold and teach pupils about British Values which are defined as: democracy, rule of law, individual liberty, mutual respect, tolerance of those of different faiths and beliefs. English has a pre-eminent place in education and in society. A high-quality education in English will teach pupils to speak and write fluently so that they can communicate their ideas and emotions to others and through their reading and listening, others can communicate with them. Through reading in particular, pupils have a chance to develop culturally, emotionally, intellectually, socially and spiritually. Literature, especially, plays a key role in such development. Reading also enables pupils both to acquire knowledge and to build on what they already know. All the skills of language are essential to participating fully as a member of society. At Broadwater we follow a 'Discovery Curriculum' that combines the subjects across the curriculum. This is the way that we have grouped the subjects of the National Curriculum together. Our discovery curriculum is split into three overarching topics: 'We are Historians', 'We are Geographers' and 'We are Innovators'. This helps us to ensure that our curriculum is broad and balanced and introduces essential knowledge and skills to give pupils the grounding to become educated citizens. PSHE education is a planned, developmental programme of learning through which children and young people acquire the knowledge, understanding and skills they need to manage their lives now and in the future. As part of a whole-school approach, PSHE education develops the qualities and attributes pupils need to thrive as individuals, family members and members of society. At Broadwater Primary School, we understand the importance of starting primary school. To help you along we have included all the information you will need when you choose a school for your child. Whether your child is starting out at Primary School or you are looking to join us midyear, we are happy to lend a helping hand. Get in touch to find out more. The care, guidance and support given to pupils are a major strength and this helps to explain why the pupils contribute so successfully to the life of the school. Throughout the school, the curriculum has a number of strengths that include the provision of a wide range of out-of-school activities and experiences, as well as a strong focus on literacy and numeracy.